An interesting discussion of Traditionalism has been published by Damian Howard, a Christian theologian and Jesuit priest. 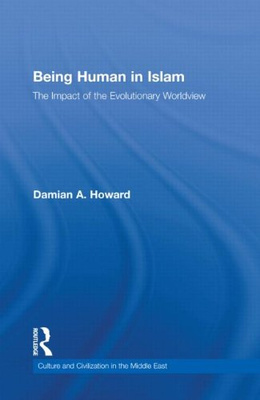 Howard's 2011 book, Being Human in Islam: The Impact of the Evolutionary Worldview (Abingdon: Routledge), deals with three Islamic approaches to the challenges raised by the theory of evolution. First come approaches inspired by Henri Bergson, second comes the Traditionalist approach, and third and last come approaches Howard places under the rubric of Islamization of knowledge--Syed Muhammad al-Attas and the International Institute of Islamic Thought (IIIT). None exactly mainstream in Islam, then, but all interesting. Howard explains his selection of Traditionalism on grounds of its inherent interest, and of the influence Traditionalist views have among non-Traditionalist Muslims, especially in the West. For Howard, Traditionalism's rejection of evolution follows inevitably from its rejection of modernity--a rejection which he sees as itself problematic. Firstly, the Traditionalist conception of tradition is simply too all-inclusive: "it elides radically different models of revelation" (p. 110). Secondly, to see modernity as "pure negation of the transcendent" (p, 118) is to grant too much to modernity, in effect to accept modernity's own claim to be unique. Howard himself would prefer to distinguish the major elements that he sees Traditionmalism lumping together as "tradition"--"emanationist metaphysics, initiatory esotericism, a theology of revelation" (p. 117)--and to see modernity as "a complex, multi-layered phenomenon" (p. 118). An interesting critique, and an interesting book. A forthcoming article in a new architectural journal, Frontiers of Architectural Research (Elsevier), deals comprehensively with Traditionalist approaches to geometric patterns. This is an established topic among Traditionalists, on which Keith Critchlow, Titus Burckhardt, and--most famously--Nader Ardalan and Laleh Bakhtiar have all written. 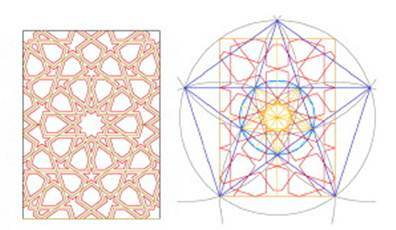 I do not, however, know of a major recent contribution in this area, so the article, "Geometric proportions: The underlying structure of design process for Islamic geometric patterns," is of interest. The article is also of interest because its author, Loai Dabbour, is head of Architectural Engineering at Alzaytoonah University in Jordan, a country in which interest in Traditionalism has been noted before. Following the successful re-housing of Études Traditionnelles, 1960-85, two other journals are looking for a new home. 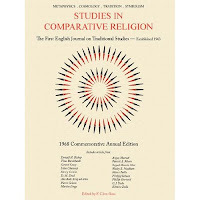 They are Symbolos: Arte, Cultura, Gnosis, 1990-2007, and Studies in Comparative Religion, 1970-84. Symbolos: Arte, Cultura, Gnosis: Complete run of nos. 1 (1990) through 32 (2007: ceased publication) in 20 volumes. Page counts from 190 pp. (no. 1) to 576 pp. (double no. 31-32). 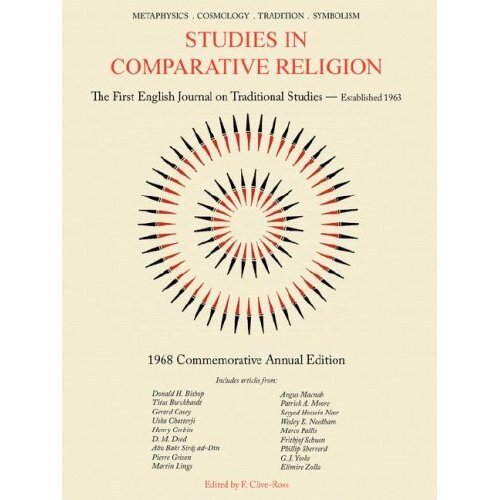 Studies in Comparative Religion: Unbroken run from vol. 4, no.1 (1970) through vol. 17, nos. 1-2 ("1984"; actually some years later, and therewith ceased publication). Bound as six volumes in red library buckram. Plus loose numbers as follows: 1/1, 1/4, 2/1, 2/2, 2/4, 3/1, 3/2. Symbolos: Arte, Cultura, Gnosis was a Spanish-language periodical of Traditionalist (Guenonian), Hermetic, and Masonic inspiration, edited by Federico González. 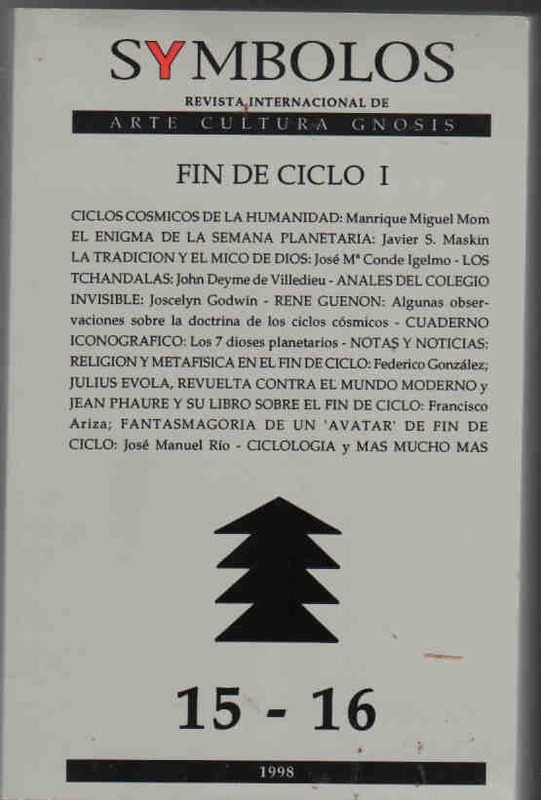 Published from Guatemala City and printed in Barcelona, this was the chief vehicle for Traditionalist scholarship, speculation, and controversy in the Spanish-speaking world, and González himself its most authoritative spokesman in that world, with many separate publications to his name. Symbolos carries extremely rich and serious articles and reviews by Spanish, Latin-American, and (translated) foreign authors, especially on historic (cyclical), artistic, symbolic, and geographical topics. The editorial approach is non-dogmatic, more sympathetic to Hermetic, Pythagorean currents than to the monotheistic religions, and more respectful of Guenon's than of Schuon's example. Would those interested in giving either or both of these journals a new home please email me (mjs@teo.au.dk) a few sentences describing the proposed new home--that is, who you are and what you will do with them. I will then pass your name and those few sentences to the donor, who will make the final decision.